Water has been on our minds since the first time we visited the village in 2010. Water is so scarce. 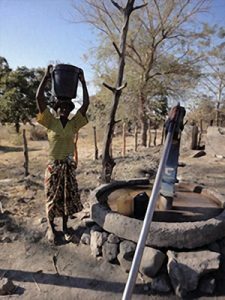 Chisuma village has few wells to service thousands of villagers. Many have to walk long distances to carry water to their homes. This task can take up 10 to 15 hours of their time each week. 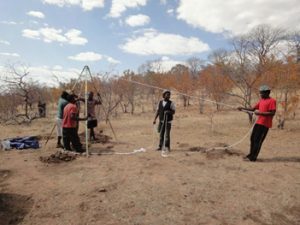 One of our first goals was to find a way to manually drill for water so the villagers could learn to use the equipment and continue adding wells. A church in Michigan donated the equipment designed for this purpose. We designed some new pieces from railroad ties to break through rock. We tried to drill in locations where it was most likely to hit water. But due to the prolonged drought the area has been experiencing for several years, the water table has dropped and we cannot reach it manually. This Spring, we have hoped we were going to be able to have a well drilled by a drilling rig. It is much cheaper to get a well drilled by a rig if the rig is already in town. There was one in Victoria Falls this Spring. The operator said he could come to the village to drill but only if we had a surveyor identify the best locations to find water. That has been problematic. The only surveyor in the area had moved away. We set up appointments with one from Bulawayo but he never showed up. So the rig moved on to another area. We will continue to try to find a geologist/surveyor to study the land in the village and to mark a few spots. Next time a rig comes through, hopefully, we will be ready to employ them to drill more wells in the village.